Wabi-Sabi: Which Super Hero Are You? 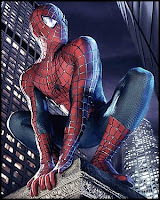 According to the Superhero Personality Quiz, I am Spider-Man! "You are intelligent, witty, a bit geeky and have great power and responsibility." Hattip to the Film Geek, er, I mean the Green Lantern.